Book Club: A story filled with action, suspense, and humor, Gentlemen of the Road by Michael Chabon is an entertaining tale of two antiheroes who do heroic things. This month, Old St. Pat's Book Group meets to discuss Amazing Adventures of Kavalier and Clay By Michael Chabon. They will be meeting at a member's house for holiday celebrations! Old St. Pat's book group will meet to discuss The Adventures of Kavalier and Clay By Michael Chabon. Join us for a reading group discussion of Telegraph Avenue by Michael Chabon! New York Times-bestselling, Pulitzer Prize-winning novelist Chabon goes to Telegraph Avenue in a big-hearted novel that explores the lives of two Oakland, California families, one black and one white, and the pop culture that surrounds them. Join us for a reading group discussion of Maps and Legends by Michael Chabon! The author of the Pulitzer Prize-winning The Amazing Adventures of Kavalier & Clay pens a work of literary non-fiction--a series of linked essays in praise of reading and writing. Michael Chabon's book Bookends is currently available from LibraryThing Early Reviewers. Michael Chabon's book The Mysteries of Pittsburgh is currently available from LibraryThing Early Reviewers. Michael Chabon is currently considered a "single author." If one or more works are by a distinct, homonymous authors, go ahead and split the author. 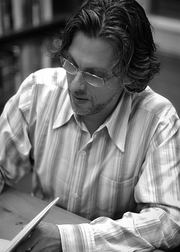 Michael Chabon is composed of 19 names. You can examine and separate out names.